Eri, a girl who likes to stay indoors, meets a mysterious but enthusiastic transfer student named Haru. Eri used to love to sing and Haru loves Eri's singing. The story follows the two during one summer of their high school life as their love sometimes overlaps and sometimes passes by each other. Project by Studio Deen announced to be part of Anime Mirai 2015.
well this movie is listed as slice of life, but comedy suits it better. The story is simply yet interesting, the art is beautiful. There isnt much time wasted on fan service, a plus from me. The characters are interesting....the teacher Sakata sure is funny. Even though the title of the movie is "Music" girls, I didnt find the voice or music particularly special. My overall rating for Ongaku Shoujo is 7/10. Is it good as a slice of life movie? Im not sure but its definitely a nice comedy. 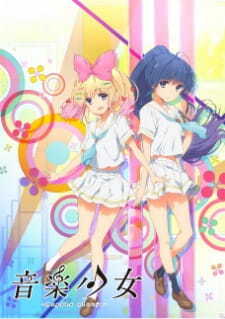 just a normal cute anime that it's unfortunaly only one episode 15 minutes.cute girls doing cute things VERSION singing and a little bit of shoujo-ai that can't be seen without yuri goggles. i wanted this to become an actual series but unfortunaly there isn't still any news of this. 5/10,another story of cute lovely girls that want to become idols and do their best for becoming an idol.there isn't any new thing that makes new fans and new people to hype for that they might make an actual series. it was a while since i saw such a cute art in an anime,it's a waste to have only one episode for this cute art,cute eyes.lips.and face also their bodies. there isn't anything new just cute songs that are always everywhere. i enjoyed it but even if i want an actual series i don't know how much it could make me enjoy it.maybe if there was an actual story everything could change. well i guess it was good!that's it.yeah it was good...i guess? For starters this 1 episode is part of the Moe/Music genre. Theres not much to talk about since its only 25 minutes but ill make a fast review. My reviews are normally low in score but as a 20 minute movie it couldn't get a really high score either way. The art is absolutely gorgeous, it reminded me of Sakura Trick by the same studio. Animation is pretty good except in one scene where the character movements dont feel right. Background art was absolutely fantastic. And girls where also super cute. Can't expect much for story, its a girl meets other girl and they try to (spoiler) sing at a concert. I guess it was average, at least it didnt feel clutered. Is it worth the 20 minutes of your life? In my opinion: yes, absolutely even if only for the colors and the liveliness of the art. To be honest, I probably got my hopes up too high when I heard Taishi's Ongaku Shoujo project was being adapted by Studio DEEN into an OVA for Anime Mirai 2015. I've been a huge fan of his music for several years now, and was excited to see it finally come to life. Unfortunately, as most small project adaptations go, it was the typical "cool to see but not very good". Story - Fated meetings with transfer students, moving into a shared room, discovering a roommate's secret talent, working hard together only to find that one of them is moving to another country and didn't tell them, pulling through anyway... all rather cliche tropes. They don't even count as spoilers at this point, that's how cliche they are. Sound - As I mentioned before, Taishi is one of my favourite artists, so I'm probably a bit biased here, but I'll try. General soundtrack was not particularly spectacular. The songs were okay, definitely not his best works. The finale song however was somewhat disappointing compared with the teaser sample he released on niconico earlier, probably because of the nature of the scene itself. That being said I wouldn't hesitate to acquire and listen to the full version (not edited with reverb etc. for the anime). Enjoyment - Was okay, but it wouldn't be first port of call if I was looking for something nice to watch when bored or procrastinating.